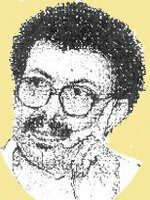 Amir Taj Al-Sir (sometimes Amir Tagelsir or Amir Tag Elsir) is a Sudanese writer who currently lives and works in Doha, Qatar. He has published two biographies and one collection of poetry; this is his tenth novel. Al-Sir was born in the north of Sudan in 1960. He graduated from the faculty of medicine, and notes, on his website, that he worked for many years in Sudan as a gynecologist. He now works as a physician in Qatar. He began by writing poetry, but shifted to novels in 1987, and published his first novel in 1988. There are many writers…we should know…they created new writing in Arabic novels and really international. The best of them is the Sudanese AMIR TAG ELSIR. Author’s site (which hasn’t been updated in several years). Previously profiled: Egyptian Miral al-Tahawy, longlisted for her Brooklyn Heights, Bensalam Himmich, for My Tormentor, Fawaz Haddad, for God’s Soldiers, Khairy Shalaby, for Istasia, Raja Alem for The Doves’ Necklace, Renee Hayek for A Short Life, Waciny Laredj for The Andalucian House, Maha Hassan for Secret Rope, Mohammad Achaari for The Arch and the Butterfly, Maqbul Moussa Al-Alawi for Turmoil in Jeddah, Khaled al-Berry for Middle Eastern Dance, Razan Naim al-Maghrabi for Women of Wind, Fatin al-Murr for Common Sins, and Ibtisam Teressy for her Eye of the Sun. Finished! And just in time, as the shortlist should be announced later this week.